Customers love using the pricing tool to play with all of the available options and come up with the specifications to give them the best bang for their buck. Once they’ve decided on a set of specifications, they can save them for future reference or to place an order. A leading digital book manufacturer publishing thousands of titles every year. Offers services to publishers of various size and self-publishers. Distribution of this tool is challenging and requires customization for each client. Updating the workbook and notifying the users was a tasking process. 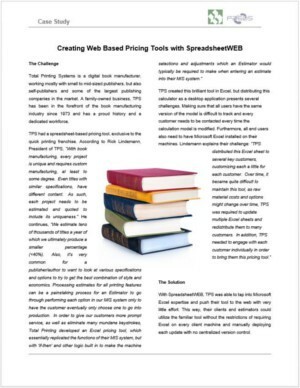 The same look and feel of the tool was retained with SpreadsheetWEB. Developing the tool ground-up from scratch was going to be costly. The process of generating quotes has been standardized into a single system. Orders and customer preferences can be tracked directly from the software. The need for maintaining a server and IT resources have been eliminated by deploying the tool on the cloud.